The S.I.R. 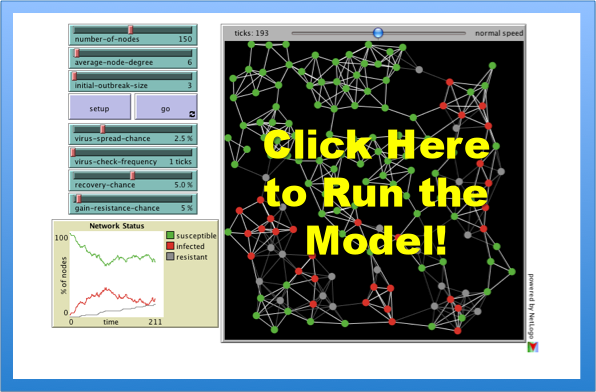 Model — A Simple Model With Applications to Swine Flu, etc. Last week we offered a model of intellectual diffusion built upon a standard fare social epidemiology model. Given recent events within the United States, Mexico and potentially worldwide, we thought it would be worthwhile to highlight the classic S.I.R. (Susceptible, Infected, Recovered) model. Netlogo offers a user friendly version of the model. Using this platform, we hope the exploration of the dynamics of S.I.R. might prove illuminating. First, various hosts have different levels of interactions (work, home, transit, etc.) and so this network approach represents a blunt measure. To start the model at the default parameters, push the SETUP Button and then the GO Button. As the model runs, the plot tracks the Susceptible, Infected, Recovered. The model contains a variety of “sliders.” The model can be rerun at lots of combinations of parameter levels. Those “sliders” fall into several categories: Network Attributes, Virus Attributes, Node Attributes. The full documentation is available here. An additional parameter worthy of consideration is the VIRUS-SPREAD-CHANCE. Consider this slider as a rough measure of the underlying infectiousness of the virus in question. It is important to note the above simulation is an incredible simplification of the world faced by public health officials. Additionally, this version of the model was designed to consider the spread of disease on a computer network. Notwithstanding these limitations, we thought it useful to highlight a computational approach to this important matter of public concern. Previous Previous post: The CLS Working Group on the SSRN! Next Next post: Arlen Specter…. A Red in Blue Territory…Turns Blue… Click Below!